August in Montaldo means many things; the calm before the storm in the vineyards, getting the cellar ready for the 'big show' (borrowing Kevin Costners famous line from Bull Durham), a layer of mosquitos that are of a special malevolent Piemontese breed, the sound, sight and smell of 'heat' omnipresent every day in everything you do (no AC in Montaldo folks)... and last but not least, a bright spot in the horizon, the month Fabrizio's mother makes, "La Conserva," that will get us through the rest of the year. The day was chosen, Friday the 19th, the tomato's were ordered, 50 Kilos, and the human sized pot was dragged out and dusted off from last years batch. 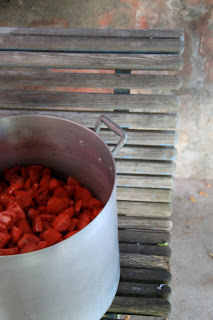 We hand cleaned the 50 Kilos of tomatoes one by one, basically polishing them with a damp cloth. They are the variety we call 'Roma' tomatoes in the US, but here are called 'perette' or 'little pear' tomatoes. 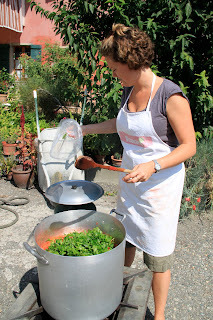 Mariuccia (Fabrizio's mother) uses these because they have the least amount of water concentration. I then understood better why we were hand polishing each tomato rather than dumping them in a sink... just like cleaning mushrooms; water is the enemy. Once shined up, we quartered them and threw them into the cauldron. The adding of the parsley... a big moment! The pot started cooking at around 10:30 in the AM, we pulled it off around 5:30. Always stirring. Once pulled off Mariuccia added sugar to balance out the acidity of the tomatoes. After letting it cool about 1 hour, we started ladling the mixture into the 'passavedure' or food mills. 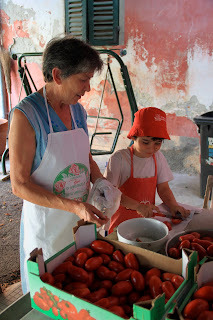 We then manually turned and turned, cranked and cranked, grinding the 'soup' together and leaving the skins, seeds and stems out, and leaving with us a velvety, scrumptious, tomato sauce. The final step was jarring. "It's good, simple, why would you change it?" There is so much wisdom in that response, I had to laugh at my own question, and tell her she was absolutely right, and that I wouldn't change it either :). The entire project lasted a full day, we took a break around 11:00 for bread and salami (obviously) and a quick glass of fresh white wine to wash it down, then we all ate lunch together at 1:00, a little break after lunch, and finished up that evening. The jarring was done after dinner. With 50 Kilos of tomatoes we ended up with only 30 jars of 'la conserva' to last two families all year long. This allocation of 15 jars made me nervous, and got me to thinking about 'allocations'. In thinking about allocating out these 15 jars of la conserva for the rest of the year, I started thinking about allocations in wine. We recently had to start allocating out the Bocchino's entry level Nebbiolo, 'Roccabella'. We started with the 2008 vintage, and there were 500 cases. They sold out in 8 months, and it was the first vintage ever produced of this label. The wine took off this winter, and before we knew it there was 30 cases left, and all of our distributors and NY clients were writing emails and calling wanting 100+ cases more, as the wine in a matter of months had been placed in restaurants by the glass across the country. We quickly shipped the 2009, of which there was a little more... 700 cases, and we are already half way through that in 2-3 months. It is our number one selling wine, and the reason for that is easy; It's good, simple, and he is not trying to 'change' it (sound familiar). It is pure Nebbiolo from a place, no bells or whistles, made by two people that know Nebbiolo almost as well as Mariuccia knows her 'conserva'. It is priced fairly, so that everyone can enjoy it. The tricky part is making enough that everyone get's some, and can have a good run with it, enjoy it, and then if they have to wait a month or two until the next vintage comes in ... well, we think that's ok, and will make it taste that much better when it does come back. We eat seasonally, and why wouldn't we also drink seasonally! We've allocated the 2009 out between our distributors across the county as well as in NY/NJ, and so just like we know we have only 30 jars of la conserva to get us through the winter, these guys know how much Roccabella they have to get them through the winter as well. If there were endless supplies of Roccabella and La Conserva, they would be found on grocery store shelves, and discount stores, and not, instead, just in our own private cellars. This is what I love about living in a small Mediterranean village. It has to be done with very ripe tomatoes, and these came from my father-in-law's vegetable garden. 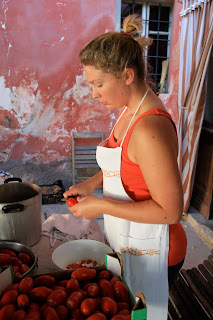 Peel the tomatoes and remove the seeds (Like Mariuccia, we want to keep water to a minimum). Stuff the tomato flesh into jars and close tightly. Put the jars into a large cauldron of water. Bring the cauldron to a boil and boil the jars for about half an hour. Next day (when the water's cooled down) remove the jars and leave them a couple of days standing upside down to check for leaks.